Right before I went to see Orphée et Eurydice at Lyric Opera of Chicago, I dug out my copy of Ovid’s Metamorphoses and re-read the tragic tale. It has a well-known plot: Orpheus’ wife Eurydice dies; Orpheus travels to Hades to retrieve her from the dead; when he looks back at her on their way back to Earth, Eurydice dies a second time, this time for good. If you haven’t read Ovid’s version, the first thing you’ll notice is how short it is: the entire story consists of a whopping 85 lines of poetry. How could such a short tale provide enough dramatic fodder for an entire opera? Well, the truth is that it doesn’t. I found out last night that that’s why you bring in a world-class ballet! 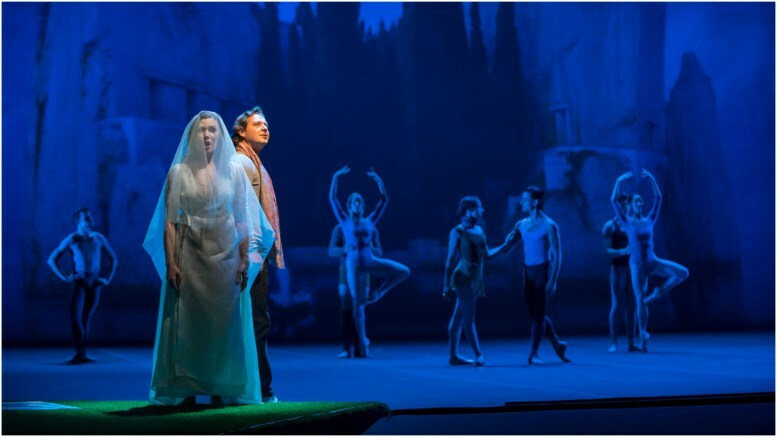 Joining Russian tenor Dmitry Korchak (Orphée), Canadian soprano Andriana Chuchman (Eurydice), and American soprano Lauren Snouffer (Amour) on stage was the magnificent Joffrey Ballet, a Chicago-based company. I went into the theater expecting to see an opera with some incidental dancing, but I could not have been more wrong; the production was as much a work of dance as it was a sung story. I’ll be the first to admit that I’m out of my element when it comes to ballet, but even this neophyte couldn’t help but be captivated by the fluid, effortless motions of the Joffrey Ballet dancers. How did dancing come to play such a significant role in this opera? Christoph Willibald Gluck originally composed Orfeo ed Euridice in 1762 for the Burgtheater in Vienna. As the name implies, it was an Italian work. The role of Orfeo was played by a castrato – an (unfortunate) voice type manufactured by castrating boys prior to their journey through puberty. The era of the castrati was nearing its end in the second half of the 18th century, but it was not yet a relic of the past by the time Gluck embarked upon Orfeo. Fortunately for young boys, the French never bought into castrati, so when Gluck revamped Orfeo for his Parisian audience in 1774, he cut out (no pun intended) the castrato and transformed the role of Orfeo into the French Orphée, a haute-contre, or high tenor, role. Also to suit French tastes, Gluck added dance – a lot of it. Orphée et Eurydice was the baby of director, choreographer, and set, costume, and lighting designer John Neumeier, who changed the traditionally lyre-playing musician Orphée into a choreographer leading a dance company in modern times. 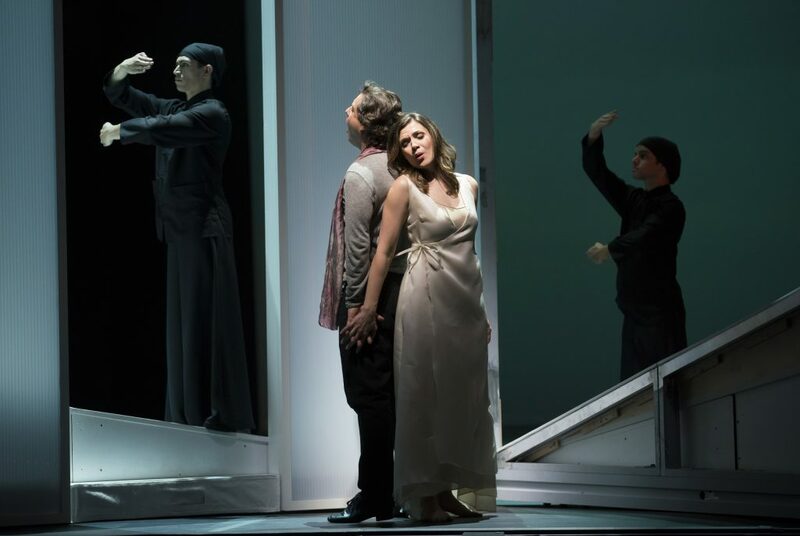 The opera opens with a tiff between the title characters, culminating with a public slap across Orphée’s face and Eurydice’s tramping out of the rehearsal space. Presumably in her angered state following the incident, Eurydice slams her car into a tree, rolls out of the vehicle, and perishes. Neumeier made some other changes as well. Orphée didn’t travel to Hades; instead, he imagined a trip to Hades. In the end, Orphée does not get to spend the rest of his life with his beloved as Gluck (but not the ancients) intended. Well, not completely, anyway. Amour explains to him that his deceased wife will remain with him, but only in his heart. Modern adaptations like these don’t always work in the opera house, but they certainly did in this case. The production’s three singers were in good shape vocally, and Orphée’s brutally high passages posed no serious threat to Dmitry Korchak. His bravura aria in the first act was solid, displaying his excellent breath support. Ryan Opera Center alumnus Andriana Churchman was a convincing Eurydice, and Lauren Snouffer appeared very comfortable in her role as Amour. I only wish Gluck had provided both female roles with a bit more singing; there were many points at which it felt like a one-man show. 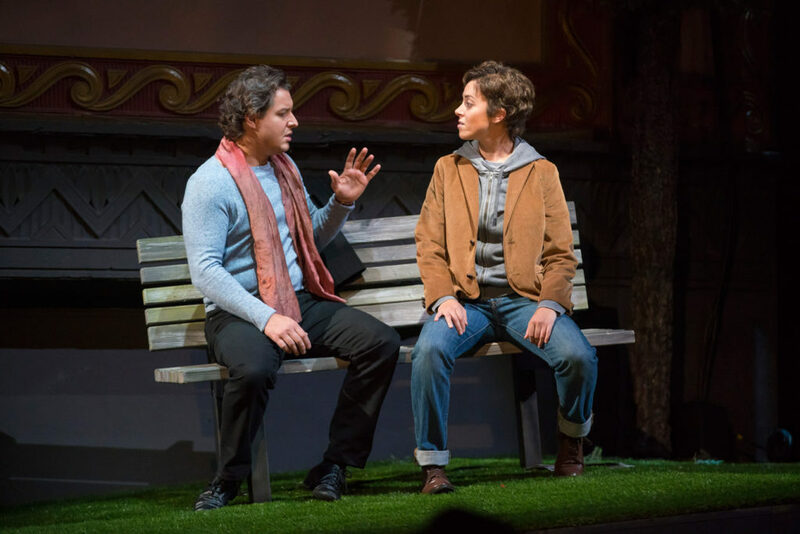 Lyric’s chorus, a significant character in the opera, was spot-on, and the small orchestra, led by Harry Bicket, was as responsive and effective as ever. Like virtually every opera before Mozart, Gluck’s most well-known masterpiece Orphée et Eurydice has lost some of its revolutionary flavor over time; no longer do a few brass notes while Orphée is in Hades or simpler arias in an attempt to better serve the story, features that were radical at the time and almost certainly noticed by everyone in the audience, excite the modern operagoer. Gluck’s tremendous influence on the genre, however, cannot be overstated, and Lyric’s Orphée et Eurydice is a tremendous service to his legacy.